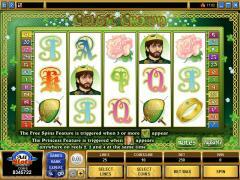 Celtic Crown is a video slot game designed and produced by Microgaming, one of the leaders in online casino software. The game, which obviously has an old Celtic theme, allows the player to play one to 25 paylines, with the opportunity to participate in a Free Spins Bonus Game and a Gamble Feature that can double or quadruple any wins that are achieved in the game. You start things off in Celtic Crown by adjusting the coin size for your wagers. This is done with a control at the bottom left of the interface, which lets you pick a range of anywhere from .01 to .25. The increments available are .01, ,02, .05, .10, .02 and .25. And then you are going to select the number of paylines, up to 25, that you are going to enable, keeping in mind that no winning combinations are paid on a payline that is NOT enabled. From there, you'll just click the "spin" button, which is at the bottom right-hand corner. By clicking "Bet Max" you'll pretty much cut to the chase and make the maximum wager possible. 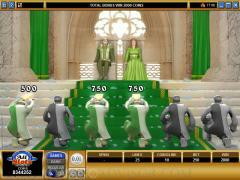 In this game, the Harp symbol is the scatter, and when three or more Harp symbols are scattered anywhere on the reels, it activates the Free Spins Bonus Game, during which you would get a number of free spins that are actually determined by the random numbers that appear on the Harp symbols themselves. When three or more Harps come up during the Free Spins game, you'll win more free spins, which is very nice. The Princess symbol is termed a "substitute" symbol, which means it is a wild, and can be used to complete winning combinations, except those that require the scatter. 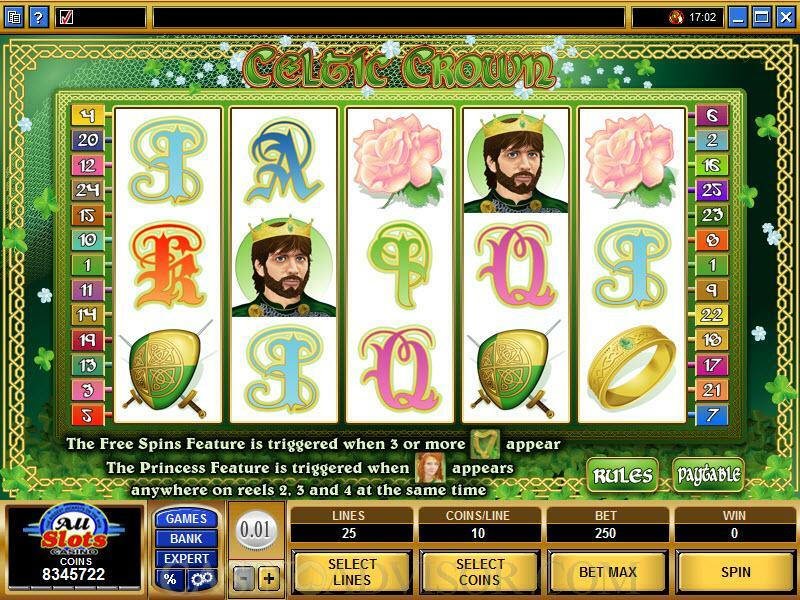 What it also does is open the door to get you into the Princess Bonus Game, when three or more of them appear on reels 2, 3 and 4. In that bonus game, you would select three Knights out of six that are displayed on the screen, and will win the random bonus amounts behind those Knights. Another bonus feature is the Gamble Bonus Game, which is activated upon any win. It presents the options of guessing a face-down card's color or its suit. If you guess the correct color, your win is doubled. If you guess the correct suit, the win is quadrupled. Interested in reading more detailed information about Celtic Crown? If so Click Here for more details.